When presented with the choice, do you climb the stairs or take the elevator/escalator? Click here for the entire Gothamist article. Perhaps Ms. Romm should be the spokesperson for Mayor Bloomberg's stair walking initiative. Some folks over at Fox News did not appreciate Mayor Bloomberg's stair walking proposal. 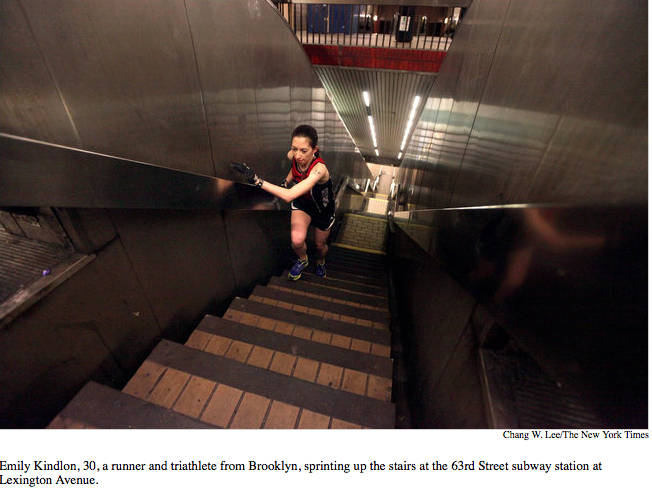 More on stair climbing for exercise from NY Times. I'm going to rest for a while. A ridiculously large number of young, able-bodied, unencumbered people wait for the elevator at the Roosevelt Island subway station. I am amazed, and I always want to shout "It's escalators ALL THE WAY UP! You don't have to walk at all!!" Totally agreed. It was frustrating when my kids were still in a stroller. I actually had to compete with others for a spot. At one time I made the "mistake" to let an elderly lady out first and in return I lost my spot to tens of able-bodied people. I had to wait for the next elevator. On the other hand there is this obnoxious older woman here on RI who rides her bicycle all the time. Nothing wrong with that but... One day at the 63rd St stop she insisted that people get out of the elevator so she and her bicycle could get in. She blocked the door until I suggested to call upstairs for the cops to figure out what's next. Stupid people. I think disabled and strollers are first priority. Then regular riders, then cyclists. So, she should have waited for the next elevator.